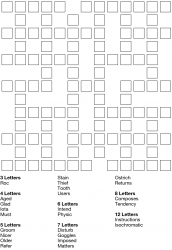 In Criss-Cross puzzles the solver must place a given list of words into the grid, crossword style, or in other words with one word placed per continuous run of boxes. 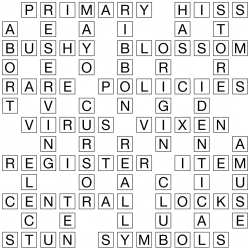 Usually the words are provided sorted by length for ease of finding. The set of words to find can either be generic or it can be topic-specific, as in the 'types of tree' example here; in this particular example words are also allowed to repeat for added difficulty. 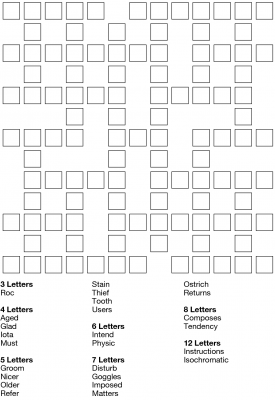 Kriss-Kross puzzles / Fit Word puzzles, as they are also known, can vary from easy to much harder. 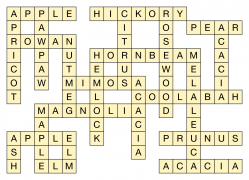 In an easy puzzle, for example, there might be only one word of a given length which must fit into a particular slot, while in a harder example there are typically many words of the same length and some basic logic must be used to work out which word fits where. 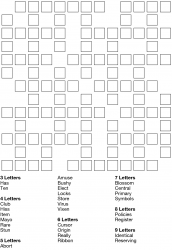 Example placed words can also be pre-inserted into the grid if particularly easy puzzles are required.